Central Boiler Wood Burning Furnaces are very popular and many consider them the "cadillac" of Outdoor Wood Burning Furnaces. We have sold hundreds of these furnaces and our customers are always more than willing to tell us how much they love their furnace. 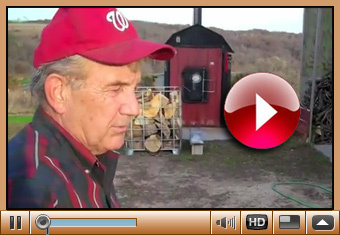 Listen as one such customer, Jack Potter of Dodgeville, WI does that. You can heat your entire home, business place, workshop or barn easily with an outdoor wood burning boiler for less cost than traditional heating systems. Outdoor wood burning boilers use a cost-effective, sustainable fuel source that provides you with the option for an environmentally friendly, economical and efficient heating system. Many are even qualified for the EPA Phase 2 Program. 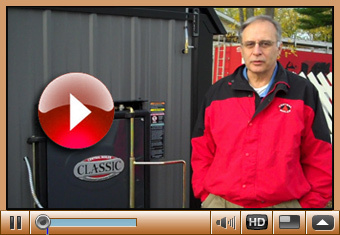 Listen as George Breiwa, president of CSI (parent company of Dubuque Fireplace and Patio) explains more about Central Boiler Outdoor Furnaces. We offer both the original Classic Outdoor Wood Furnace and the newer E-Classic model that boasts a 92% efficiency rate and already meets the EPA Phase 2 program requirements. There are several models that have won the prestigious industry “Vesta Award” for innovation.To learn more or review the models available to you, come into our location in Dubuque, Iowa. We can help you decide on the best option for you whether you are thinking about retrofitting your home for an outdoor wood furnace or heating a new area. We offer an excellent selection of boilers and furnaces from Central Boiler, PSG and Woodchuck. Outdoor wood burning boilers are installed outside your home, business place, barn or outbuilding from 15 to 500 feet away. Whether you have a forced-air, radiant baseboard or radiant floor heating system, they are designed to work with your pre-existing heating system. If the space you desire to heat does not have a current heating system you will be able to decide how the heat is circulated through your space. Wood boilers are designed with a central firebox and water jacket that circulates heat by using heated water pumped to your building through insulated pipes. For those with in-floor, radiant heating, the hot water heated by a wood boiler will be sent through the in-floor tubes. This provides steady, consistent and controllable heat for your home or shop. For those with forced-air heating, a water-to-air heat exchanger will heat your home with the energy from the hot water. Whatever your heating system, you will be able to control the heat circulated through your home by a normal thermostat. Talk to the Wood Burning Furnace & Boiler Experts at Dubuque Fireplace & Patio.